So… how much did the Kickstarter actually raise? The answer… we actually still don’t know yet! Kickstarter takes a couple of weeks to redeem and process all the credit card payments, and we should get the funds sometime next week. A few people had their credit cards declined, but some of them were able to switch over to Paypal instead. In any case, the campaign was a success and we will receive the funds soon! 1) We’ll be adding more music to the game soon! 2) Will’s nearly-impossible “Impending Doom” mission will be made public, and we’ll be holding a worldwide contest to see who can finish it first! Details to come, but expect it to go live sometime later in January. Q: My friends missed out on the Kickstarter? Can they still support Prismata and get in on the Kickstarter rewards? Yes! We set up a quick and dirty Paypal site for precisely this. It was put together in only a couple of hours, so it may not have many features, but it does work! Anyone who pledges to us via Paypal will receive an email from us within 24 hours containing all the keys and other information, just like for the rest of our Kickstarter backers. The tiers remain the same as those on the Kickstarter page. Sorry about the 24 hour delay; we do have to process these manually. We’ll be looking to get a more automated setup up and running fairly soon! If anyone has any issues with Paypal or wants to upgrade or change their tier, email Alex, as he’s handling all the fulfillment for now. Q: I noticed the Kickstarter funding level drop toward the end. What happened? There were actually several times that this happened. We had one donor pledge the maximum amount ($8000 for a Canadian Kickstarter) and then withdraw it a few hours later (a troll, I suppose?). And though we had very few people withdraw their pledges during the last day, one of our early donors who had pledged a very large amount decided to cancel their pledge at the last minute and Paypal the money to us instead. One thing to note: Kickstarter campaigns, once funded, cannot be unfunded within the last 24 hours if they are past their funding goal, so there was no risk of us losing everything. Knowing this, none of us were worried, though I still don’t quite understand why the Kickstarter page says we hit exactly $140k. In any case, everything’s fine and we’ll be getting the funds soon. Q: When will the campaign/skins/arena mode/etc. be ready? Campaign and tutorial: ongoing throughout 2015. I hope that we’ll have a preview ready for the spring, and a good chunk of the campaign fully playable by summer. Not sure if we’ll release it one episode at a time, or all at once. Bonus mission/puzzle packs: These will consist of content that we amass while working on campaign missions, so probably they won’t be ready until the campaign is. Raids: I have no idea. 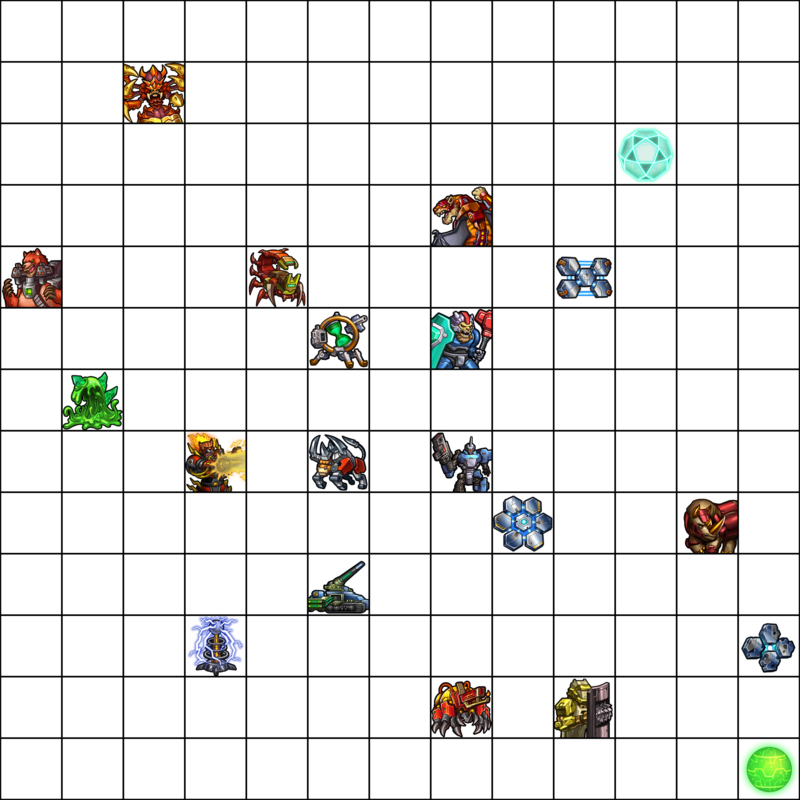 Graphical and quality-of-life improvements to the game and interface: continually! Q: What are the future plans for the blog? We’ll get back to weekly updates soon. Got some cool graphics to show off next week. Future blog posts will probably lean toward more updates/teasers and general devblogs/videos/explanations of what’s going on, and there will be a bit less editorial content; I’ll try to write at least one good article a month, but they do take quite of bit of time that I’d rather spend on the game! If you’re hungry for more content and haven’t checked out our Kickstarter page lately, we do have 17 update videos posted, including all kinds of explanations of stuff like the campaign, the story, and raids! Edit: It’s been posted! See below. 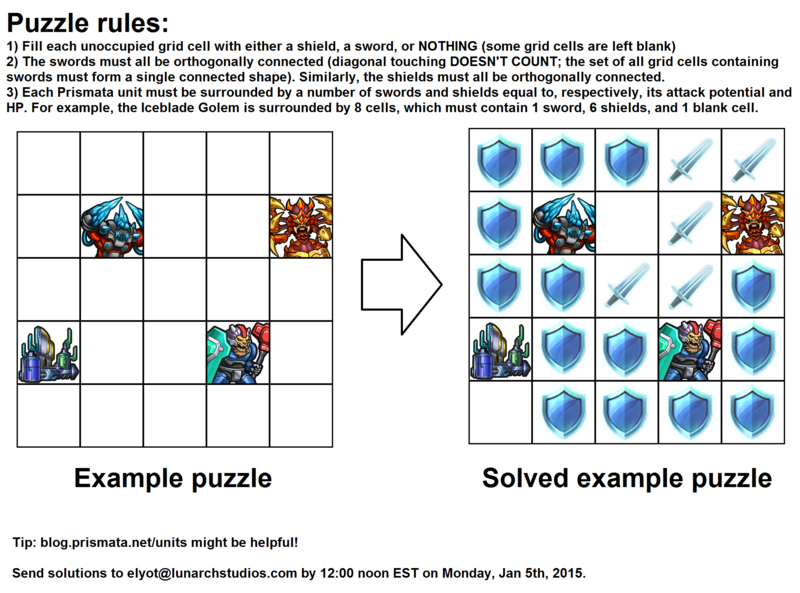 So, as a little special something for the new year, I’ve created a Prismata-themed puzzle that I’ll be posting at 12 noon EST on Saturday in this blog article. You don’t need anything other than MS paint to solve it, though a printer and a few pencils/erasers might help. It’s a logical/analytical puzzle in the style of contests like the World Puzzle Championship, and all instructions (as well as an example) will be posted have now been posted! The first 5 people to email me a correct solution will get a legendary Prismata emote (a solution could be a crappy camera phone photograph, a scan, or just an MS paint document), and anybody else who sends a correct solution to me in 48 hours or less will be entered in a draw to win one of 5 more. Solutions can use any type of formatting but I need to be able to read it and it should be clear that you’ve completed the puzzle.